First and ONLY Totally Free Credit-Based Safelist Online! 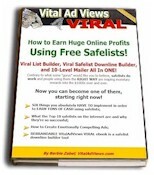 How to Earn Huge Online Profits Using Free Safelists! Safelists are online *communities* comprised of people who joined them for the specific purpose of advertising spam-free to all other members of the list. When joining a safelist, you also agree to receive all other members' advertising messages. All safelists do not perform exactly the same way, however. Many safelists are simple ad exchanges - "I get to send ads to you and you get to send ads to me." Those types of safelists are a not as effective in getting your message seen and your site visited because they don't offer any incentive for members to do so. We Guarantee YOUR Ads Will Be Read! VitalAdViews members WILL view your offer because they receive spendable credits automatically when they visit other members' websites! When members earn credits, they can send their own ad to as many other members as they have credits (if you have 50 credits, you can send your ad to 50 members). Our special safelist script ensures that YOUR site gets guaranteed visitors who stay on your page for a minimum of 20 seconds each! Generous Sign Up Credits with Your FREE UPGRADES! Need More Credits? Click the Credit Links in Our Members' Ads! Ad Send Timer - Set your ads to be sent when YOU want them sent with our exclusive 24 hour timer! That means you only need to login ONCE to set your ads to send throughout the day. Lottery Links - Each email has a chance of containing a Lottery Link which will win random extra credits. Bounce Handling - So that you don't waste your time and money on dead accounts, VitalAdViews uses a specialized Bounce Management system which ensures you're mailing to ACTIVE MEMBERS (unlike other lists where members can be inactive for months or even years!). Vacation Setting - Turn your account off at any time to prevent your inbox from filling up while you're away. HTML Ads - Get your readers' attention with your choice of fonts, colors, even graphics! FREE List Solos Ads - For our members who want their ads to STAND OUT from the crowd and get viewed FIRST, List Solo Ads are now added FREE to every member (number dependent on membership level) and can be sent to all active members' List email address in text or HTML whenever you wish, even with our exclusive 24 hour timer! Our List Solo Ads contain EXTRA CREDITS so they are sure to be read before our standard ads! FREE Credit Solo Ads - Members can now grab a STAND ALONE ad that will be sent to all active members' Contact email address using their credits instead of cash! ACTIVE MEMBERS ONLY - No auto-join or submitters are allowed access to our membership! Use Safelists for what they ARE - Popular Email Blasters To Gain Subscribers, Business Partners, Sales and Profits For a FRACTION OF THE COST of Pay Per Click! Become Our Free Internet Marketing Company Affiliate And Earn Credits to Grab Even More Solos, List Solos, Daily Ad Sending, Text and Banner Ads! The Safelist Marketing Climate Does Change, So This Comparison May Change Without Notice - Review Regularly! GET a Free Upgrade to PRO! To prevent the few bad apples out there from cheating the system and abusing YOUR MEMBERSHIP here, our free level has only 1 mailing per month privileges. Cheaters have been known to have multiple accounts in each of many, MANY safelists at the same time. Cheaters have been known to send YOU an email ad from EACH account at EACH safelist, abusing your space quota at your email address. Cheaters have been known to use *bots* to automate their multiple joining, logging in and sending of their multiple ads hands free, abusing your space quota at your email address. CHEATERS NEVER READ YOUR ADS - they only SEND their own ads to YOU, abusing the *I'll read your ads if you read mine* safelist terms and your space quota at your email address. So I'm offering you a free upgrade to PRO! However, you must be manually approved to receive your free upgrade. Get a FREE PRO UPGRADE by 1) joining, 2) verifying your email addresses, and then 3) following the directions you receive in your welcome message. Messages sent with this type of mailer typically do not get read because they don't contain a credit link... We want your ads to be VIEWED, therefore, we do not offer this type of mailer at any membership level. Automatically added to your account the first of each month. Safelists As Blasters? How to Use Them! 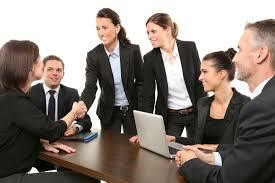 For a FRACTION OF THE COST of Pay Per Click!" LIKE TO BE A FOUNDER?